Dried Chile Salsa for sale. Buy online at Zingerman's Mail Order. Gourmet Gifts. Food Gifts. Making this deep, brick red salsa starts by toasting six different chile peppers—including anchoes, guajillos, and chipotles—in hot oil until they begin to smoke. 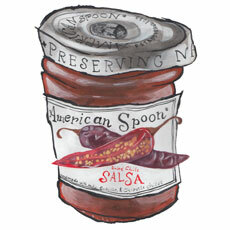 When you open a jar, you'll immediately notice that deep, roasty chile aroma. The flavor is toasty, rich in a way that reminds me of good Oaxacan mole sauce, yet smooth and balanced with a bright acidity. There’s a slow-growing heat that’s pronounced but never overwhelming. The texture is smooth, not chunky, with small bits of peppers and spices. It’s outstanding alongside grilled meats, as a marinade for beef or pork, or as a rich addition to your breakfast burrito.